Not to be confused with Duchy of Brunswick. The Duchy of Brunswick-Lüneburg (German: Herzogtum Braunschweig-Lüneburg), or more properly Duchy of Brunswick and Lüneburg, was an historical ducal state from the late Middle Ages until the late Early Modern era within the North-Western domains of the Holy Roman Empire of the German Nation, in what is now northern Germany. 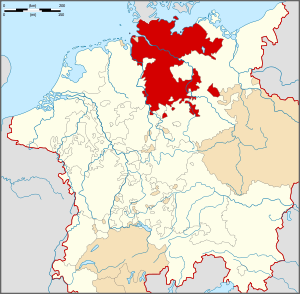 The dukedom emerged in 1235 from the allodial lands of the House of Welf in Saxony and was granted as an imperial fief to Otto the Child, a grandson of Henry the Lion. Its name came from the two largest towns in the territory: Brunswick and Lüneburg. The duchy was divided several times during the High Middle Ages amongst various lines of the House of Welf, but the rulers all continued to be styled as the "Duke of Brunswick-Lüneburg" in addition to their various particular titles. The individual principalities making up the duchy continued to exist until the end of the Holy Roman Empire in 1806. Following the Congress of Vienna in 1814/15, the territories became part of the Kingdom of Hanover and Duchy of Brunswick. In 1269 the duchy was divided, Albert receiving the southern part of the state around Brunswick and John the northern territories in the area of Lüneburg. The towns of Lüneburg and Brunswick remained in the overall possession of the House of Welf until 1512 and 1671 respectively. In 1571 the Amt of Calvörde became an exclave of the Duchy. The various parts of the duchy were further divided and re-united over the centuries, all of them being ruled by the Welf or Guelph dynasty, who maintained close relations with one another—not infrequently by marrying cousins— a practice far more common than is the case today, even among the peasantry of the Holy Roman Empire, for the salic inheritance laws in effect, encouraged the practice of retaining control of lands and benefits. The seats of power moved in the meantime from Brunswick and Lüneburg to Celle and Wolfenbüttel as the towns asserted their independence. In 1269 the Principality of Brunswick was formed following the first division of the Duchy of Brunswick-Lüneburg. In 1432, as a result of increasing tensions with the townsfolk of Brunswick, the Brunswick Line moved their Residence to Wolfenbüttel into a water castle, which was expanded into a Schloss, whilst the town was developed into a royal seat. 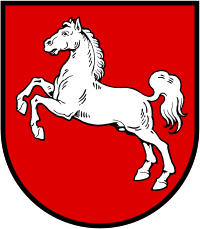 The name Wolfenbüttel was given to this principality. Not until 1753/1754 was the Residence moved back to Brunswick, into the newly built Brunswick Palace. 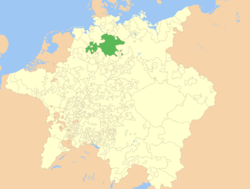 In 1814 the principality became the Duchy of Brunswick. After a little over a decade, the matter of the disputed electorate was settled upon the heir, and the new Duke of Brunswick-Lüneburg (acceded as duke on 23 January 1698), George I Louis was able to style himself the Elector of Brunswick and Lüneburg from 1708. It was not just happenstance but similar religious driven politics that brought about the circumstance that he was also put into the line of succession for the British crown by the Settlement Act of 1701— which was written to ensure a Protestant succession to the thrones of Scotland and England at a time when anti-Catholic sentiment ran high in much of Northern Europe and much of Great Britain. In the event, George I succeeded his second cousin Anne, Queen of Great Britain — the last reigning member of the House of Stuart, and subsequently formed a personal union from 1 August 1714 between the British crown and the duchy of Brunswick-Lüneburg (electorate of Hanover) which would last until well after the end of the Napoleonic wars more than a century later—including even through the dissolution of the Holy Roman Empire and the rise of a new successor kingdom. In that manner, the "Electorate of Hanover" (the core duchy) was enlarged with the addition of other lands and became the kingdom of Hanover in 1814 at the peace conferences (Congress of Vienna) settling the future shape of Europe in the aftermath of the Napoleonic wars. In 1700 and 1701, when the English Parliament had addressed the question of an orderly succession, with a particular religious bias toward a Protestant ruler, from the childless ruling Queen Anne (House of Stuart), it passed by the provisions of the Act of Settlement 1701 to Sophia of Hanover, granddaughter of James I. Sophia predeceased Queen Anne by a few weeks, but her son and heir, George I, succeeded as King of Great Britain when Anne, his second cousin, died in August 1714. Great Britain and Hanover remained united in personal union until the accession of Queen Victoria in 1837. John, (1242–1277) 1252–1269 Duke of Brunswick-Lüneburg. Ruled jointly with Albert. 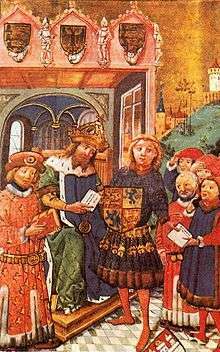 Albert the Tall, (1236–1279) 1252–1269 Duke of Brunswick-Lüneburg. Ruled jointly with John. All the Welf lines continued to bear the title of "Duke of Brunswick-Lüneburg" from the division of the dukedom in 1269 to the end of the Holy Roman Empire in 1806. This was in addition to their actual territorial lordship e.g. as the "Prince of Lüneburg". ↑ Riedesel, Friedrich Adolf (1868). von Eelking, Max, ed. Memoirs, and Letters and Journals, of Major General Riedesel During His Residence in America. 1. Translated by Stone, William L. Albany: J. Munsell. p. 29. I remain ever, Your affectionate Charles, Duke of Brunswick and Lüneburg. Brunswick, February 14, 1776. To Colonel Riedesel.